Steelbook looks great. Unfortunately the movie isn't 'rewatchable' for me. Gorgeous! I love this type of artwork. I'm excited to see what they'll come up with for the slips. I hope they do something cool with the black and white theme. Google translate seems to indicate a Februari release date? I'm glad the notebook appears to be in English! (Hope they fix the typo on the page with the dog though). 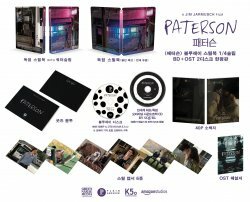 "Paterson Blu-ray SteelBook Premium Box - Outer Box Design (rendered image). 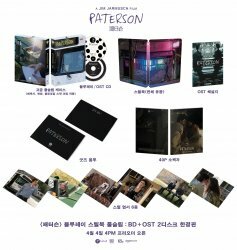 The physical package is made of high quality imported black paper containing fine silver pearl particles on a cardboard box. The frame is stamped on the top plate with engraved engraving, and the picture is pasted. Preorder in February!" I ignored it when they did this to Mommy. 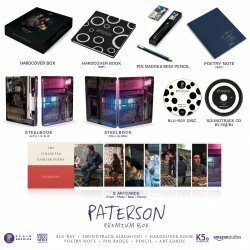 I actually want the Paterson steel. I hope they give a full slip option but the book is square. I don't like this trend. Awesome. The premium box looks stunning. In usually buy 1/4 slips and try to avoid box sets to focus on the standalone steelbooks, but THIS is other-level-beauty for a film that I adored!! Day 1 purchase!!!! So it’s just the hardcover box? There’s no slips like normal, or am I missing something, cos all they’ve been mentioning & promoting is the hardcover box.